Managed portfolios seem to becoming more popular as more people want to invest, but aren't sure how. What is a managed portfolio or what are portfolio management services? 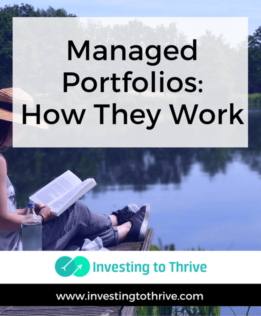 Generally, a managed portfolio is one in which a professional manages investments on a client's behalf. Typically, the client will pay a flat or sliding-scale fee based on the portfolio size. The fee is calculated by multiplying a percentage (such as 0.25% or 1.0% set by the investment or brokerage firm) by the assets under management (AUM). The AUM represents the dollar value of investments being managed. Clients may also be charged trading fees associated with this service, as the costs of specific transactions may be passed along to the investor. Further, there may be supplemental fees for auxiliary services, such as tax planning and preparation related to the investments. Note that there is a difference between a firm that manages a portfolio and one that provides investment recommendations. Portfolio management typically involves managing money in a way that protects and grows wealth over time. The nuances of a firm’s approach may vary depending on its philosophy and a client's preferences. Investment recommendations are individual picks that should be suitable for a client based on financial goals, time horizons, and risk tolerance; however, they are more like standalone suggestions. Such selections don’t necessarily fit within an overall scheme of managing wealth for the long haul. They are ideas for possibly increasing wealth. So, portfolio management tends to involve establishing an appropriate asset allocation model for the investor and then purchasing, monitoring, selling, and re-balancing investments that fit within that model. The idea is to achieve growth within certain parameters of risk. Investment recommendations are (hopefully) made on the strength of an individual stock, mutual fund, or ETF. How the investment fits within a broader plan is typically not considered. I don’t have time to manage my own portfolio. The main reason to let someone else manage a portfolio is that I have little time, or I’d rather spend my time pursuing other activities. So, basically, I'm outsourcing this part of my financial life and I pay a fee for this service. I may not think I'm smart enough to manage my money. At certain times of life, I might think that portfolio managers are smarter or somehow better equipped than me to manage investments. Especially at the beginning of my investing life or during busy times, an investment professional may have a better handle on investing than I do.Most people are smart enough to learn on their own but still may prefer to let someone else handle portfolio management. Time spent on investments could better be spent on earning or saving money. Similar to reason #1, I may want to spend my time doing something besides managing my portfolio. I may be able to freelance in my spare time or run a business on the side. The money I generate from these endeavors may more than cover the portfolio manager’s fee.Likewise, the time that I save by not looking at my investments, I could spend on money-saving activities, like preparing meals for my family or handling home repair tasks. I’ll be more likely to stick with an investment plan. Having an outside professional manage my portfolio can bring discipline to my investing. If I trust my investment advisor and have chosen wisely, then I’ll be more likely to stay invested during market ups and downs. I can see how other people manage money. An advantage of having a managed portfolio is that I can see the contents of a managed portfolio (often before I invest but certainly after I invest). Then, I can monitor your portfolio’s holdings and performance, compared to my goals and market benchmarks (such as the S&P 500). There are many ways that portfolio management can be interpreted and applied in the real world, in terms of actual products and services available to investors. At one extreme is broad wealth management that includes portfolio management. In this case, for example, a small private firm manages the finances of high-net-worth families with multimillion-dollar portfolios. Services provided may include estate planning, tax planning, risk management, and business succession planning, along with portfolio management. At the other end is the target date fund, which is basically a diversified portfolio following an established asset allocation model that is adjusted as the investor nears the target date of retirement (or other event for which cash is needed to pay expenses). This choice may be found in a 401(k) plan or a brokerage firm. Lately, there have been more opportunities for investors to outsource their portfolio management needs or build a portfolio using tools provided by brokerage firms. Generally, these are accessible to investors with minimums that start at $5,000. When I invest with Betterment, all of my money is invested immediately in a portfolio designed by its professionals (but which can be refined by me). There is no account minimum. An annual fee of 0.25% is charged on portfolio balances, up to $5,000 yearly (unless you access financial planning services). Betterment has a lot of user-friendly features that include a goal setting mechanism that helps me align my investments and portfolios with a specific goal and time horizon. Rebalancing is free and there are no trading or transaction fees. Also, the firm provides investors with a tax-loss harvesting feature, which may improve investment returns. Motif Investing is a unique brokerage firm that allows me to invest in big ideas, themes, or motifs. But the firm also offers diversified portfolios through its Horizon Motifs, which correspond to various risk levels and time horizons. Schwab has many types of portfolio management services. You’ll find a do-it-yourself tool on the website that allows you to design a diversified portfolio and then purchase the portfolio; the recommended minimum is $5,000. Note that you’ll need to monitor and rebalance the portfolio on your own.Originally, the firm’s first tier of managed portfolios (Schwab Managed Portfolios) were available for a minimum of $25,000. You can purchase one of more than 20 model, diversified portfolios comprised of mutual funds or ETFs. The AUM annual fee is 90% and the fee percentage declines as your balance increases. More recently, Schwab introduced its Intelligent Portfolios to compete with roboadvisory products. Schwab's minimum for this product is $5,000. As I mentioned earlier, I can devote a portion but not all of my assets to portfolio management. I don’t have to give everything over to a professional (see my series on problems with financial advisers, particularly this article on the dark side of assets under management). To determine if portfolio management could work for me, I've begun to try these services with $5,000 or less. I may move to larger amounts if I'm pleased with the arrangement. And though I don’t think there’s anything wrong with tweaking a portfolio (if allowed), making my own adjustments defeats the purpose of relying on outside help to manage money. The best way to test advice is to see how my investments perform using the portfolio services.